Blue Vane Traps - Bifelle Nyhet! Felle for overvåking av bier. Denne fellen brukes for å fange bier levende. 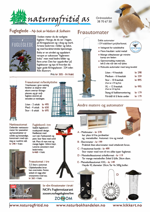 Skader ikke insektene og de kan slippes fri etter undersøkelse. Her er litt om hva som skrives om dem: Blue vane trapping overcame many of the logistical problems associated with working in these large variable landscapes. Relatively few traps were needed to collect large numbers of bees. The traps are easy to work with in field conditions, being light weight and not requiring liquids to be carried, or fluid levels to be monitored for evaporation. They do not result in wet specimens; in fact, specimen condition was excellent. The traps are selective (more than 80% of all specimens collected in our study were bees), which reduces the amount of time needed to sort through samples with non-focal individuals. In addition, unlike many active collecting methods, the effectiveness of the method is not affected by the experience and capabilities of the sampler (Westphal et al. 2008). Finally, our data also suggests that the proximity of floral resources to the trap does not decrease the efficiency of the trap, a result consistent with other work (Stephen and Rao 2007). All of these characteristics make the technique very applicable for use by non-profit and volunteer organizations world-wide. Finally, blue vane traps do not necessarily kill specimens, allowing for the potential of catch and release.